Cloud and cloud services are the latest buzz words, be it with major organizations, medium businesses, individual developers or ordinary home users. Everyone wants to share and store their documents, media and files on to the cloud. That is because it is simple, you can access it anywhere, gives you centralized storage, providesbackup and most cloud service companies claim that it is exceedingly secure. Many technology evangelists around the world foresee Cloud as the next big thing incomputer technology and predict that it will change the way we work, store, share and connect. Listed below are few common tips on how an individual or home user can effectively use cloud service. Google Docs is the most extensively used online documents storage and sharing cloud service offered by Google. It offers to store, edit, save and share all major document formats commonly in use. Even after the assurance of online reliability from Google, it is safer to keep a backup on your offline storage. Not because Google data centres may crash tomorrow, but simply because your Internet connection may face issues one day and you may need a specific document urgently. 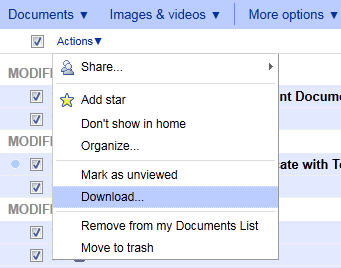 With Google Docs, you can download all your online documents into a zip file and save it offline. It allows a maximum download of only 2GB per zip file. Open Google Docs and log in using your Google account. Select checkboxes of all or only required documents. Click Actions. Click Download. Choose the respective document formats or proceed with the default selection. Click Download. Wait for the processing to complete, post which it will prompt you to open or save the zipped file. Save it offline. Dropbox is fabulously good for storing and sharing any kind of files over the Internet. You can even store your music collection on Dropbox. These music files can also be played online via DropTunes service. If you do not have any music files in your Dropbox, upload few from your hard drive. I uploaded a track by Enrique Iglesias. Now, go to DropTunes and log in with your Dropbox credentials only. Navigate to the folder where your music files are stored. It will list all music files with a Playnext to each one. Click the respective Play button to play that track online. The My Documents directory on Windows acts as a primary document storage directory for most of us. Isn’t that the sole purpose Microsoft created it in the very first place? I think yes. You can sync your My Documents directory to Dropbox. Therefore, anything you store, move or delete within My Documents will automatically synchronize with Dropbox. You should have the Dropbox client installed on your computer and a Dropbox directory already set. Right click on My Documents and select Properties. Click on Location tab. Click the Move button and choose the already set Dropbox directory. Click Select Folder. Click Apply and then OK. 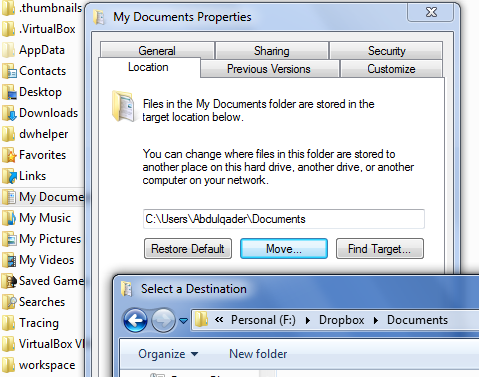 Your My Documents directory is now synced with Dropbox. Note: My Documents directory in Windows 7 may be found under the directory with your Windows Username (commonly placed on the desktop). How do you play around with Cloud services?